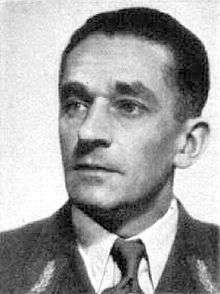 Karl Hermann Frank (24 January 1898 – 22 May 1946) was a prominent Sudeten German Nazi official in Czechoslovakia prior to and during World War II and an SS-Obergruppenführer. He was executed by hanging after World War II for his role in organizing the massacres of the people of the Czech villages of Lidice and Ležáky. Born in Karlsbad, Bohemia in Austria-Hungary (present-day Karlovy Vary, Czech Republic), Frank was taught by his father (a proponent of Georg Ritter von Schönerer's policies) about nationalist agitation. After spending an unsuccessful year at the law school of the German language Charles University in Prague, Frank wished to serve in the Austro-Hungarian Army at the end of World War I, but he was rejected due to an eye injury. After the war, Frank operated a book store and joined various right wing groups and societies, such as the Kameradschaftsbund. An extreme advocate of the incorporation of the Sudetenland into Germany, Frank joined the Deutsche Nationalsozialistische Arbeiterpartei (Sudeten German National Socialist Party or DNSAP) in 1919 and set up a book store from which he distributed Nazi propaganda. When the party was suppressed by the Czechoslovak government, Frank helped organize the Sudeten-German Homeland Front in 1933, which officially became the Sudeten German Party (SdP) in 1935. In 1935, Frank became deputy leader of the SdP and was elected a member of the Czechoslovak Parliament. Coming to represent the most radical National Socialists in the SdP, Frank was made Deputy Gauleiter of the Sudetenland when it became part of Germany in October 1938. Frank's radicalism gained him the favor of Heinrich Himmler, who made Frank an SS-Brigadeführer in November 1938. Siebel Si 204D-1, D-OWKA, used by 2./KG 200 in support of Karl Hermann Frank´s negotiations with Karl Dönitz government in May 1945. The aircraft flew between Prague and Flensburg-Mürwick and Hradec Králové. Apparently changed its markings daily. In 1939, Frank was promoted to SS-Gruppenführer and appointed Secretary of State of the Reich Protectorate of Bohemia and Moravia under Reich Protector Konstantin von Neurath. Himmler also named him the protectorate's Higher SS and Police Leader, making him its ranking SS officer. Although nominally under Neurath, Frank wielded great power in the protectorate due to his vast knowledge of Czech affairs and Himmler's support. As Secretary of State and chief of police, Frank pursued a policy of harsh suppression of dissident Czechs and pushed for the arrest of Bohemia and Moravia's Prime Minister, Alois Eliáš. These actions by Frank were countered by Neurath's "soft approach" to the Czechs thereby encouraging anti-German resistance by strikes and sabotage. This frustrated Frank and led to him secretly working to discredit Neurath. Hitler's decision to adopt a more radical approach in Bohemia and Moravia should have worked in Frank's favor. Hitler relieved Neurath of his active duties on 23 September 1941, though he still remained Reich Protector on paper. Frank hoped to be appointed as Deputy Protector and day-to-day head of the protectorate, but was passed over in favor of Reinhard Heydrich. The working relationship between Frank and Heydrich was initially tense, even though they both believed that the Czechs needed to be dealt with harshly. However, they soon put aside their differences and became an efficient and effective duo. 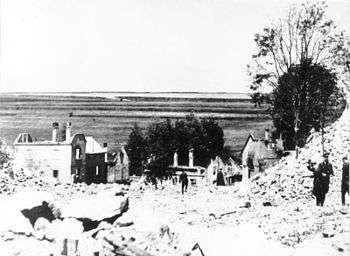 They launched a reign of terror in the protectorate, arresting and killing dozens of opponents and ramping up the deportation of Jews to concentration camps. 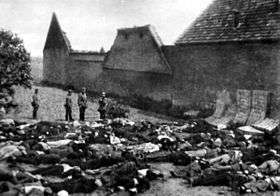 Bodies of some of the men murdered in the Lidice massacre, a notorious crime against humanity organized by Karl Frank and Kurt Daluege. Frank was married twice. On 21 January 1925 he married Anna Müller (born 5 January 1899 in Karlsbad). They divorced on 17 February 1940 (later the same year Müller remarried Karl-Hermann's successor as deputy Gauleiter of Sudetenland, SA-Brigadeführer Dr. Fritz Köllner). The couple had two sons Harald, born 20 January 1926, and Gerhard, born 22 April 1931. Harald served as a SS-Panzergrenadier with the 1. SS Division Leibstandarte Adolf Hitler and was severely wounded in March 1945 in Hungary. On 14 April 1940 Frank remarried a physician, Karola Blaschek (born 13 August 1913 in Brüx). They had one son, Wolf-Dietrich (born 20 August 1942), and two daughters Edda, (born 16 August 1941) and Holle-Sigrid (born 8 March 1944). After the war, Blaschek was held a prisoner by the Soviets until 1956 and her children grew up in care homes. 1 2 Williams, Max. Reinhard Heydrich: The Biography: Volumes 2, p 82. Michael D. Miller (2007). Leaders of the SS & German Police, Volume I: Ahrens to Gutenberg, Bender Publishing, ISBN 9329700373. Max Williams (2003). Reinhard Heydrich: The Biography: Volume 2, Ulric Publishing, ISBN 0-9537577-6-5. Williamson, Gordon (1994). The SS: Hitler's Instrument of Terror: The Full Story From Street Fighters to the Waffen-SS. Motorbooks International. ISBN 0-87938-905-2.